By Denise Ermes - marketeer at MoreApp. In the beginning of 2014 I started writing the marketing plan for this year. I heard that an event as the The Next Web Europe Conference could not be left out of the event planning. We applied for the Boost program. Boost is a brand new program of TNW dedicated to accelerating, growing and supporting the most promising early stage startups from all over the world. After a successful Skype interview we heard that MoreApp got selected for the program! It includes a 1-day branded demo table and full access to the conference. This sounds as the perfect combination. The first day a lot of enthusiastic visitors came by our booth. 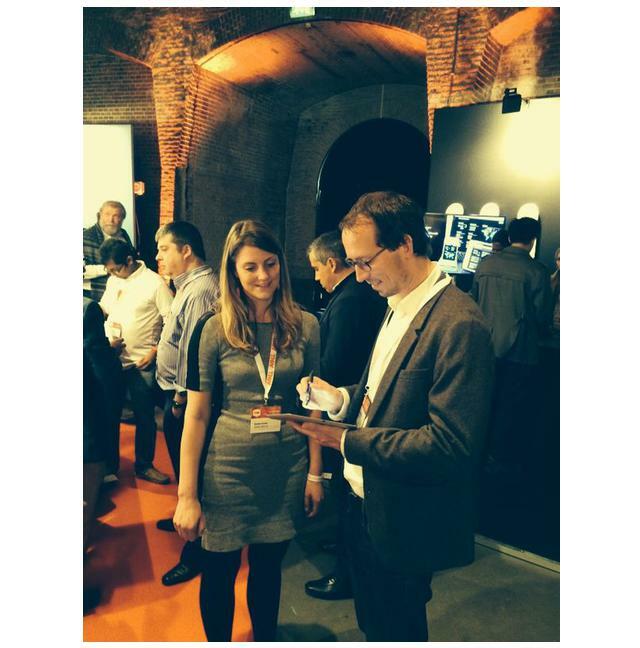 Marieke, our marketing intern, showed a special TNW form on her iPad that everyone filled in. This was done with the MoreApp pen for tablets and smartphones. When the form is completed, visitors get an email with their answers. So a digital business card is what they get. Working paperless is what MoreApp stands for. When you work digital, you have more time for fun things, like going to the beach and play with a MoreApp beach ball! Our gadgets were great :). The atmosphere of the event is very open and with a lot of young international visitors. Most of them could not really name a competitor of MoreApp. Only Google forms or SurveyGizmo passed their minds, which is good news. The second day we learned from a lot of of interesting speakers! Matt Ruby from Vooza really made us laugh, he wore a Steve Jobs sweater as obviously to imitate him. He told us if you want developers work the entire weekend, you should organize a hackaton. This was the first time I was present at such a great event. I really enjoyed it. Now let’s prepare for The Summit… MoreApp got chosen for the ALPHA program as one of the featured early stage startups!